AUTO ACRES SELLING QUALITY CARS TRUCKS AND SUVS SINCE 1976. 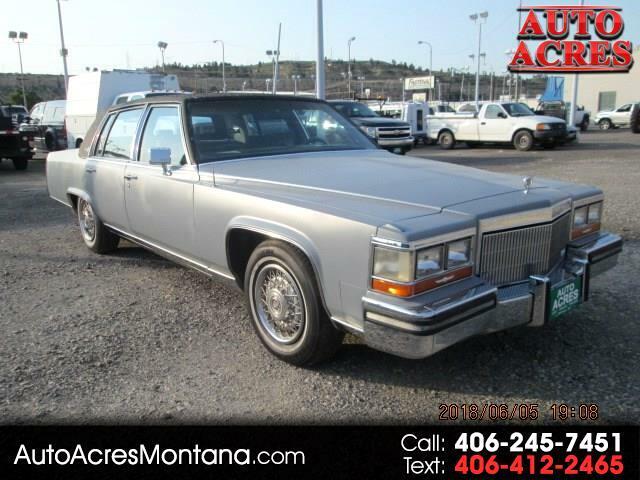 Message: Thought you might be interested in this 1989 Cadillac Brougham. THIS CAR IS A TRUE SURVIVOR OF THE FULL SIZE LUXURY,REAR WHEEL DRIVE LUXURY CARS, THIS A LOCAL MONTANA CAR, RUST FREE, THE CAR IS IN PRIMER, IT NEEDS A NEW VINYL TOP. YOU CAN FINISH IT HOWEVER YOU LIKE. THE MILES ARE ACTUAL, LOTS OF EXTERIOR TRIM IN THE TRUNK, TIRES ARE GOOD TO EXCELLENT. HAS CRACK IN THE .WIND SHIELD ATTN: OUT OF STATE BUYERS WE WILL PROVIDE $1250.00 FREIGHT ASSISTANCE.